Audiovox 7-String Model Lap Steel Electric Guitar, c. 1935, made in Seattle, WA, serial # 2369, shaded finish, walnut body and neck, original black hard shell case. Perhaps the great "lost" story in the history of electric guitars, the Audiovox brand has only recently emerged from obscurity as the legacy of one of the first pioneers of musical electrification, Paul Tutmarc. While not as well-remembered as the contemporary early Rickenbacher Electro, Vivi-Tone, or National/Dobro electrics, Tutmarc's AudioVox instruments were in production at the same time, and in some ways are more forward-looking than any. It has been recently proven that Tutmarc was the first to create a guitar-style electric bass, many years before Leo Fender. This early Audiovox steel was handmade by Tutmarc's tiny firm in the mid-1930s and is a wonderful piece of electric guitar history. Tutmarc was a Seattle player and teacher of the Hawaiian guitar who became fascinated by the concept of amplifying his instrument around 1930. With the help of another Washington resident and electronics expert, Art Stimpson, Tutmarc designed a working magnetic guitar pickup based on contemporary telephone technology. With the help of local radio expert Bob Wisner, an accompanying amplifier was also created. 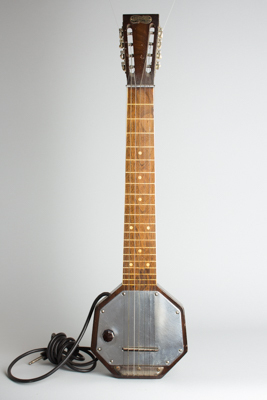 Tutmarc soon began hand-building solid-body steel guitars using his pickup, but Stimpson favored selling the idea to an established company, and indeed took the design to Dobro in Los Angeles, where it was patented as part of a proprietary guitar and became the basis for the first National and Dobro electric instruments. Tutmarc was no doubt highly displeased by this development, but continued to refine and market his own electric instruments, albeit only on a small local scale. This is a very early production Audiovox 7-string Steel guitar, built with the same octagonal wooden body used by Tutmarc for his own personal instruments. According to Tutmarc's son Bud, the woodworking and finishing on these first production steels was done by another Seattle resident, Emerald Baumsgard. Tutmarc himself fitted the electronics. The body is black walnut, very nicely sculpted and finished, with a celluloid-bound neck and inlaid fret markers. The bridge and nut are metal, as is the coverplate on the face. The bulky pickup coil is concealed underneath this, with only the blade polepiece visible. A single volume pot with an octagonal radio-style knob is mounted on the bass side. Although the instrument is set up for 7 strings, there are 8 pegs as a set of standard '20s style Waverly mandolin tuners was used. This is a very fine-sounding steel, and an extremely rare and important instrument in the development of the electric guitar. Overall length is 29 in. (73.7 cm. ), 7 3/4 in. (19.7 cm.) wide at lower bout, and 1 3/4 in. (4.4 cm.) in depth, measured at side of rim. Scale length is 20 1/2 in. (521 mm.). Width of nut is 2 1/4 in. (57 mm.). Outstandingly well-preserved for an instrument of this age and rarity. All original, including the electronics, built-in cord and plug -- even most of the strings appear period. The volume pot is pushed in slightly so the metal plate top cover has a small bend in that area; otherwise, only light play and handling wear. The original hard case is also in very fine condition. Overall Excellent + Condition.